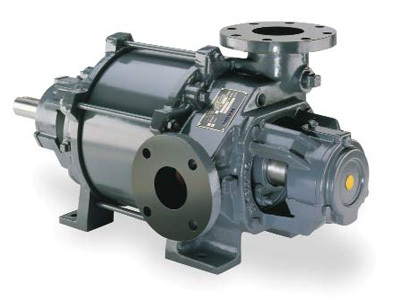 From outside, the rugged NASH vacuum pump only hints at how its internal parts function. Shaft bearings on heavy cast iron brackets are easily accessible for servicing. The top connection of the pump is the inlet, while the side section is the discharge. Some NASH pumps do have a different orientation. The NASH liquid ring vacuum pump uses water or any other suitable liquid, which acts as “liquid piston”: hence, the name liquid ring. It’s apparent that the chambers between the rotor blades, shown here in yellow, are open around the periphery. However, not easy to see, the chambers are open on the inside, as well. These inner edges of the rotor blades are machined to rotate around the cone surface (shown here in red), with a close non-contact fit. An internal passage joins the openings from the pump inlet to an inlet port in the cone. Correspondingly, there’s a passage from the cone discharge to the discharge connection on the head. Some NASH pumps may have a port plate configuration rather than conical, but the basic principle is the same. 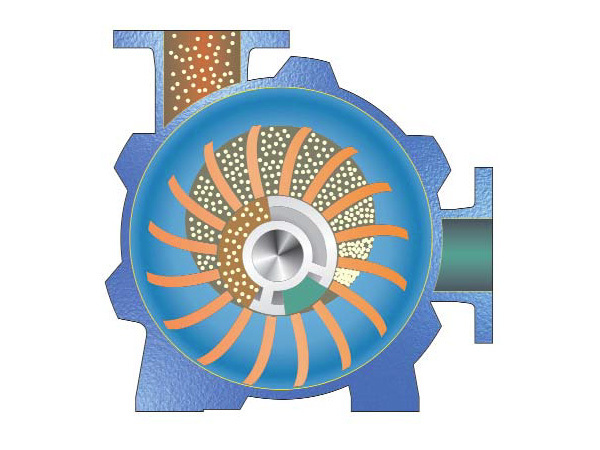 This diagram demonstrates what the rotor and the body do while the pum is in operation. The spinning of blue liquid forms a ring due to centrifugal force. 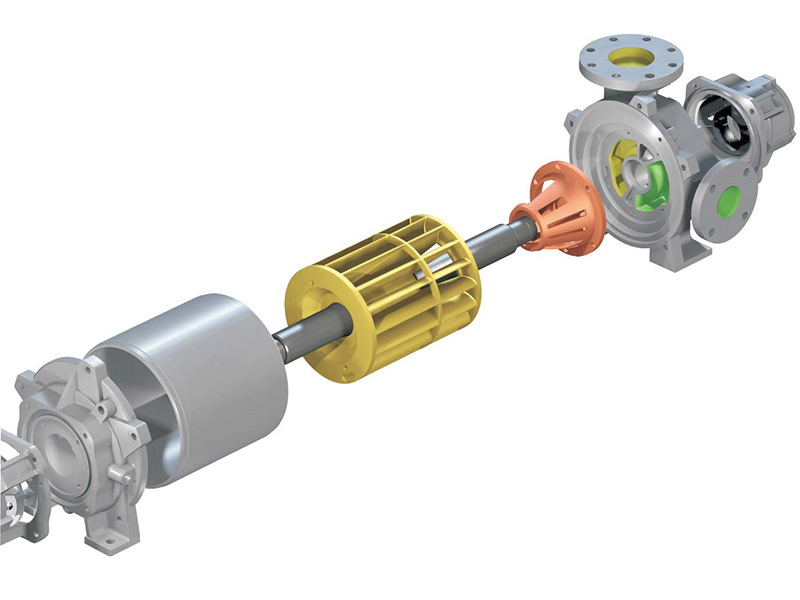 Because the rotor axis and the body axis are offset from each other, the liquid ring is not concentric with the rotor. Here air or gas entering the NASH pump is shown as white dots at the inlet connection. Air or gas traverses the internal passage to the cone inlet port. As the white dots indicate, the gas is drawn into the rotor chambers by the receding liquid ring, similar to the suction stroke of a piston in a cylinder. The liquid ring does the job of the pistons, while the rotor chambers play the part of cylinders. As each chamber, in turn, rotates past the inlet port, the chamber carries a volume of air or gas around with it. As you see, the white dots are confined between the cone and the ring of rotating liquid. The gas is compressed as the liquid ring converges with the cone. This represents, schematically, the compression of air or gas from vacuum up to atmospheric pressure, or from atmospheric up to positive pressure in a liquid ring compressor. 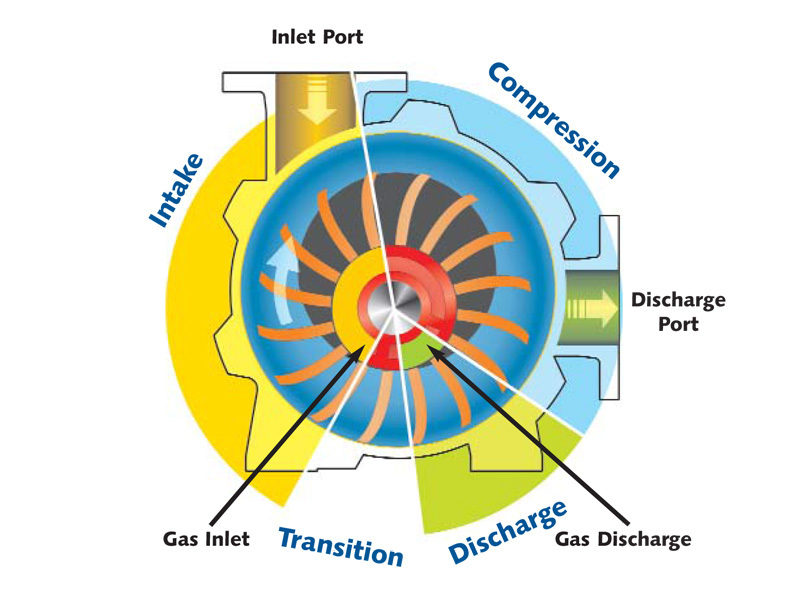 When each chamber, in turn, rotates to the discharge port opening, the compressed air or gas escapes from that chamber through the discharge port to the internal discharge passage. Air or gas, with the dots closely packed to indicate higher pressure, is shown here flowing out of the discharge connection at right. The flow is continuous without pulsation. In this completed schematic, the entire vacuum pumping cycle is shown.